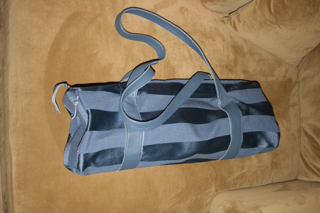 This is the Leather Waves Yoga Bag, it can hold two rolled mats, blocks, strap and a towel, or a jacket. Heavy duty plastic zippers include 2 zipped pockets, one on each end, for keys, hair ties, money and one that opens entirely across the top of the main compartment. The fabric is a heavy Tapestry print bound with 2 substantial leather straps that can handle any weight the bag is carrying. Choose from 3 fabric/leather selections including the denim blue. 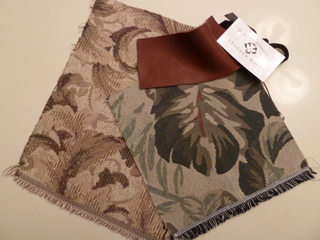 Made by Custom Order.